A POLICE officer from Bulawayo undergoing disciplinary action for allegedly deserting the force has been arrested with his wife and three others for running a drug cartel that reportedly sold dangerous substances to clients that include school children. Police recovered about 5kg of dagga, 420x100ml of Adco-Salterpyn Cough Syrup and Bron Cleer Cough Syrup including about 300 Diazepam Tablets following a raid at the cop’s home on Friday. Samuel Tambooneyi (29), his wife Pride Chaingeni (27), Chisiiwa Nyarai (20) who reside along Masotsha Avenue and Joshua Mqabuko Nkomo Street, Allen Ngwenya (33) of Pumula South and Zibusiso Sibanda (20) of Trenance suburb were arrested following a sting operation at the Masotsha Avenue house. 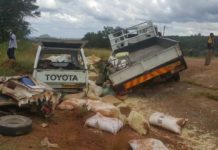 The cop allegedly said he sourced the “high grade weed (dagga)” from Malawi and got the cough mixtures and tablets from a syndicate based in South Africa. Sources who cannot be named for professional reasons said there was drama as the cop and his wife barricaded themselves in their bedroom where most of the drugs were hidden, to prevent detectives from searching the room. “They piled furniture behind the door and refused to open it. The police officers had to call for reinforcements to break down the door. It was then that they discovered the dangerous drugs,” said the source who declined to be named. A police source said the cop’s residence had been put under surveillance following a tip-off. “An unusually large number of people, mostly teenagers who could be of school-going age, frequented the place. The police intercepted some of them and found drugs,” said the source. The source said it was sad that a grown up person was destroying the future of other people’s children by selling them drugs. “That, besides being a crime, is Satanic. This guy is a cop stationed at Bulawayo Central Police Station. He is facing disciplinary action for desertion. 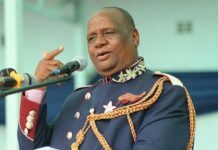 After this despicable act, he is likely to be further charged with acting in an unbecoming manner or in any manner prejudicial to good order that brings discredit to the police force,” said the source. Bulawayo police spokesperson Chief Inspector Simango could not comment on the matter. “I can’t comment on the issue because at the moment I’m not at work. I can only receive the news when I get to the office and that could be tomorrow,” she said. A majority of teens usually guzzle cough mixtures to get drunk quickly without spending as much money as they would to achieve the same state through taking alcohol. A medical expert and Mpilo’s clinical director Dr Solwayo Ngwenya is on record as strongly warning against the use of cough mixtures to get drunk. Online sources suggest Diazepam — also known as Valium — can cause death especially if it is mixed with other drugs. It is mainly used under controlled environments to treat depression, anxiety and seizures. However, it is widely used illegally to achieve “a nice instant high” through mixing it with alcohol and other drugs. “Diazepam oral tablets can slow down your brain’s activity and interfere with your judgment, thinking and motor skills. You shouldn’t drink alcohol or use other drugs while you’re on Diazepam. You also shouldn’t drive, operate machinery or do other tasks that require alertness . . .” reads one source. Prolonged use, said a medical doctor who preferred anonymity, can cause liver, bladder and kidney damage. Justice Priscilla Chigumba has been on the news lately, from being mocked by many praised too.here are a few things you might have not known about Chigumba.